goodness gracious! i truly cannot believe that the last time i posted a recipe on the blog was all the way back in july and here we are on the first day of march! that's a record. it's not that i haven't been making all sorts of delicious things in the past 8 months, it's just that i've been so incredibly busy that i haven't had a chance to take a single picture of anything that i've made. sad, for sure. on sunday i was looking around my kitchen and sighed as my eyes fell on 3 overly ripe bananas sitting on the counter. i love bananas and had high hopes for this bunch when i bought them at the grocery store last weekend, but the weather was so back-and-forth that i think those silly bananas got confused and turned ripe too fast. sure, we'll blame it on the weather. what does one do with ripe bananas? make banana bread, of course. i absolutely love banana bread in every format. 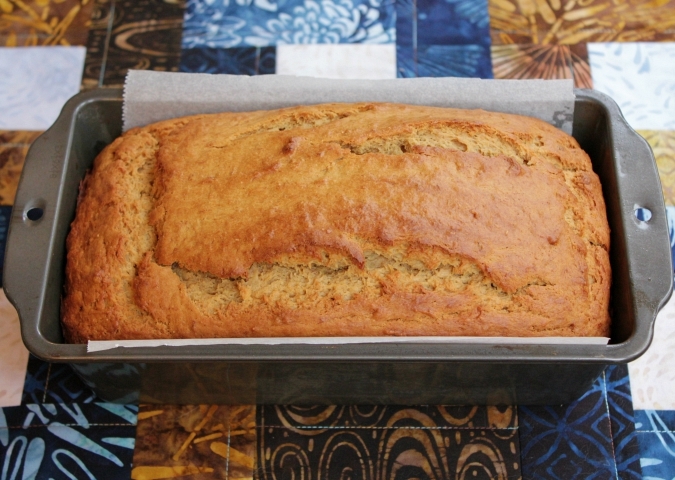 there is something nostalgic about banana walnut muffins, and something cozy about a slice of banana bread from a loaf. i knew i wanted to make a loaf of banana bread, but i wanted to change it up a bit and do something different from the traditional chopped walnuts in it. thus, peanut butter. peanut butter and banana is one of those classic combinations that i go back to again and again because it never lets me down. march 1st is national peanut butter lovers day, by the way! this was the first time i added peanut butter to the batter of my banana bread and let me tell you, it did not disappoint! as soon as you slice into this loaf it has such a wonderful peanut butter smell. 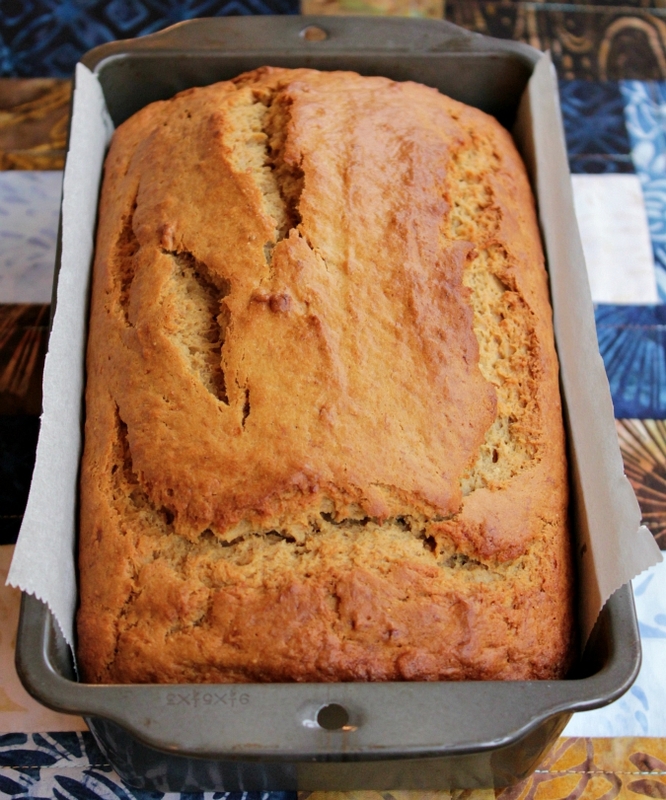 the taste of the peanut butter is subtle and gives the banana bread a nice little added something. it's a surprisingly light and fluffy bread too! ps: the cute place mat that is under the loaf was made by ryan's aunt sandy. she sure is great when it comes to sewing projects! preheat your oven to 350 degrees F. in the bowl of an electric mixer fitted with a paddle attachment, cream together the butter and sugar. add the eggs, one at a time, and beat well after each. beat in the vanilla and mashed bananas. in a microwave warm the peanut butter for 45-50 seconds until slightly melted. add the peanut butter to the batter and beat well. sift the dry ingredients into the batter and mix just until incorporated. pour the batter into a loaf pan that is greased lined with parchment paper. bake for 1 hour until the bread is golden brown and a toothpick inserted into the middle of the bread comes out clean. allow the bread to cool in the pan for 10 minutes before removing the loaf from the pan and transferring it to a wire rack to finish cooling. Looks good. Somehow I think I can smell it. Never heard of peanut butter banana only chocolate banana.